When you have multiple branches of your company, it is important to always stay in touch with them. In years past, this required you to either make direct visitors with the different branches, or you needed to call them to see how everything was going. This is no longer the case, as you can not have direct face to face conversations with these individuals heading your different offices, so you never need to go without seeing how everything is going. Of course, there are always new technologies coming out, making it easier and easier to communicate with one another, no matter where in the world you are. Regardless of how large your company is or how many branches exist, possessing the ability to hold a video conferencing is vitally important. Of course, there are other beneficial features of using such a program and hardware setup when performing video conferencing. This is because it allows you to easily and seamlessly share graphs and other bits of information, without emailing the data. You can simply upload it to your end of the video conferencing service and the other party members are able to see the information. You can also choose and select which other participants in the video conferencing chat are able to see this kind of data. Having this option allows you to save time over emailing everyone before hand, then logging onto the video conference. Outside of these programs, you can perform a video conference call, without all the expensive features and hardware options. There are numerous free programs available on the Internet that allows you to directly video chat with one another, and all you need is an Internet connection. 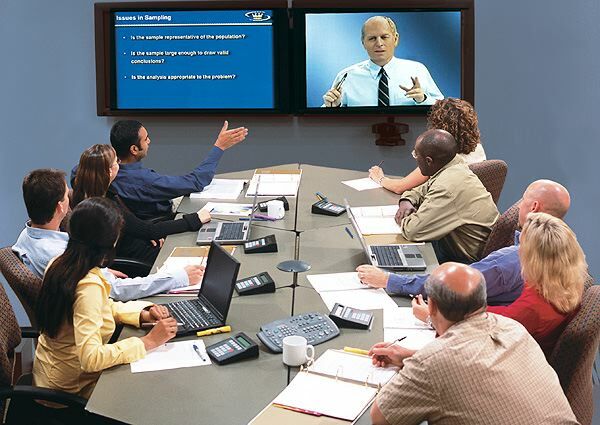 You don’t have all the same features you would with the more expensive programs, but if you are just looking for ways to conference through a video feed, these options are perfect for you. Most computers now come with a built in web camera, so matter where in the world you are, as long as there is a strong Internet connection, you can always take part in video conferencing. These programs generally don’t have the same file sharing features as the more expensive models, so keep this in mind. If you want to share files, your best bet is to email the information either during or before you perform the video chat. This way, everyone has a chance to see the data and look it over. Video conferencing is now available on just about any mobile device with an Internet connection, so you don’t even need to be around a computer in order to take part in the video conferencing call. This makes it far easier to stay in communication, and far less expensive. By giving the different employees a smart phone or tablet, you save money over buying everyone a laptop computer, plus people can still participate. On top of this, it is now possible to send and receive graphics and documents over these smaller, portable devices, so even if an individual is on their smart phone, they can still see everything necessary. If you integrate this with cloud computing, you won’t even need to email, as a simple file upload gives everyone in your business, with access to the cloud computing account, the option to view this information. Very Informative Blog, Would Like to suggest “FreeSwitch service Provider” which provides best in class voip solution all over the globe. Selecting right video conferencing tool is very important as right selection of tool provides various benefits in terms of cost, security, flexibility, productivity etc. By keeping in mind above mentioned points, one may select from a wide range of tools such as R-HUB web conferencing servers, webex, gotomeeting etc. This is a very informative article, thank you for sharing it. There are now so many options when it comes to video conferencing, although for businesses I would not recommend free programs. They often lack the features that businesses really need. Thanks, it’s important to do better research on Video Conferencing which really help you in your business !